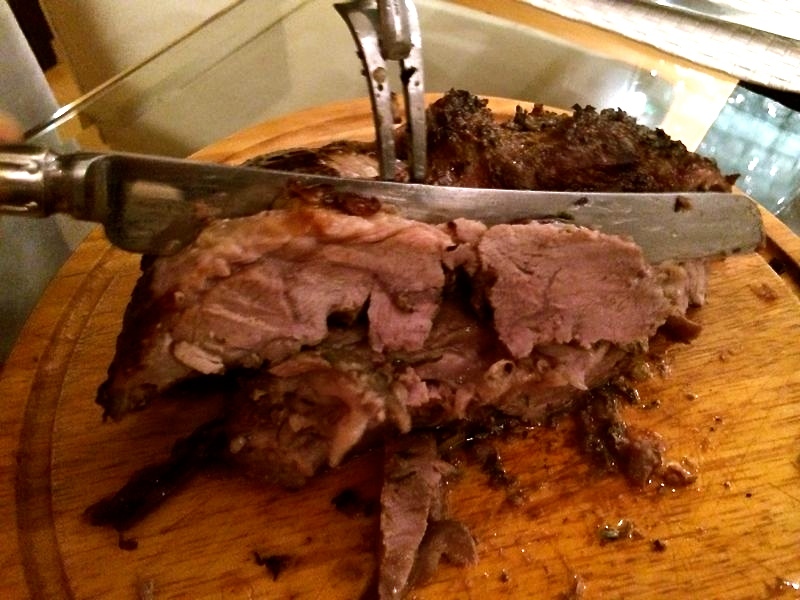 Slow Roasted Lamb Leg (or Shoulder) with … Anchovy? Here’s another recipe that’s great for a social dinner party, where time is of the essence and you want to be able to just take it out of the oven and pop it on the table. No one likes to be slaving away in the kitchen whilst the guests are all having fun outside! What sets this recipe aside? Firstly, the slow cooking and continuous basting may be a labour of love, but it gives you a wonderfully juicy tender meat, with a crispy, salty crust – yum! And secondly, for all those who turn their nose up at anchovies (like me, yuck! ), I have recently discovered with this recipe that they are SUPERB in marinades! They have a salty, rich umami flavour which really complements the flavour of the meat without being the least bit fishy. I made good use of that jar of anchovies that’s been sitting in my fridge for ages, lurking dangerously close to the expiration date. Ok fine, it had already expired, but they’re swimming (pun intended) in olive oil and tasted just fine. I’ll certainly be adding it to a lot more of my marinades from now on! 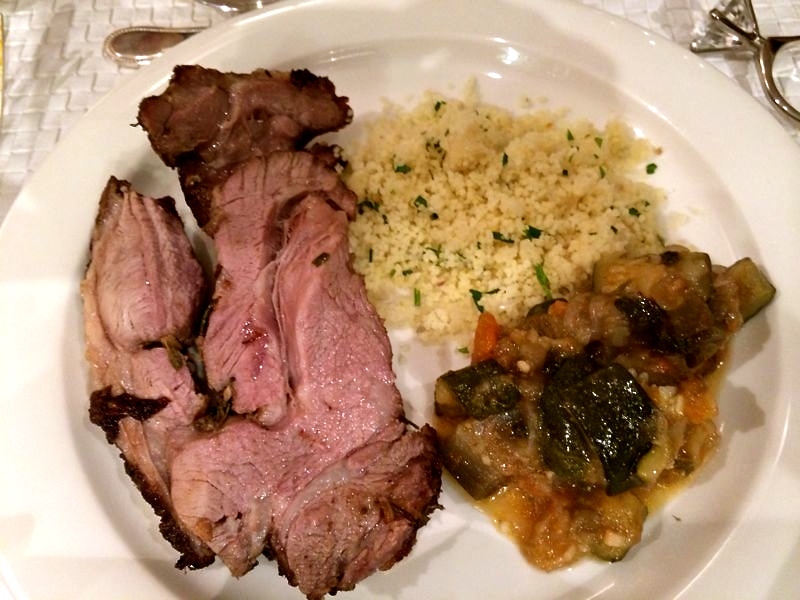 This recipe was initially intended for a boneless shoulder of lamb, but all they had at Pacific Gourmet was boneless leg of lamb, and I find that they are interchangeable most of the time. ♥ Prepare your mini-chopper or blender, and in goes your rosemary (leaves only, no stem), lemon zest (peel it off with a vegetable peeler), anchovies, garlic, mustard powder, pepper, vinegar, and oil. Leave the salt out for now, it will dry the meat if added to the marinade. Blend until the mixture turns into a coarse paste. ♥ Rub half of mixture into inside of butterflied lamb leg. Roll it back up and tie securely at 1-inch intervals with butcher’s twine. rub the remaining mixture over the exterior of lamb. Cover and leave to marinate in the fridge for at least 3-4 hours, or even overnight. ♥ Preheat the oven to 220°C (430°F). Take the meat out of the fridge 30 minutes before cooking to bring it to room temperature. Place the meat on a rack in a foil-lined baking pan, and sprinkle generously with salt – this will give it a nice salty crust, love that stuff! Cook in the oven for 30 minutes, then lower the hear to 130°C/270°F, or 110°C/230°F in a fan assisted oven. Cook for another 2 1/2 hours, basting and flipping the meat every 30 minutes. ♥ Remove the lamb from the oven and let rest on the counter under a sheet of foil for 20 minutes whilst you make the jus (if using). I always use these tips from Delia Smith on how to make REAL gravy – she’s classic and I always end up with a great jus. No more of that Bisto nonsense!